Children need protection constantly, however, sometimes the parent they are living with is unfit to handle their needs. States have in place laws that help protect children if their parent has demonstrated an inability to properly care for them. This might come in many forms, but the most common reasons a child would be taken away from their parent is if their parent was abusive, either verbally or physically, or if they were neglecting their child. The child could also be taken away if a parent kidnaps their child from another parent or if there is a sudden death or incapacity of both parents. In these emergency situations, your local courts can step in and issue a specialized custody order so that the child can be properly taken care of. You would typically only need an order, such as an emergency custody order, if the child was in imminent danger or neglect. For example, if a child is in physical danger, say, from an abusive parent, local court can grant emergency custody of that child. This means that someone other than the child’s biological parents can assume temporary custody. So, that guardian would then be responsible for caring for that child and making sure they attend school regularly. The Uniform Child Custody Jurisdiction and Enforcement Act (UCCJEA) is a legislation in most states that has authority over the law of child custody in most of America. Ultimately, it is the UCCJEA’s authority to determine where courts can issue custody orders for each child. Where the court can issue custody is dependant on where the child has lived for over six months. This particular legislation was designed to limit interstate kidnapping by non-custodial parents. For example, if a non-custodial parent was unhappy with the way the other spouse was raising their child, it would discourage them from kidnapping their child and establishing custody in another state. Because there is an overall governing body, this means that every child is accounted for and two parents can’t assume full custody of their child. Instead, parents can decide on one parent having total custody, or both parents sharing custody. Who Can Be Granted This Order? The idea behind an emergency custody order is that it displaces a child from a dangerous situation. If there is evidence of abuse or neglect, anyone has the right to submit for an emergency custody order. This means that anyone, related or not, can assume custody of a child who isn’t being cared for. If you are aware of a neglectful situation or that a child is being wrongfully treated, you will have to report it to your local child welfare or social services department. Taking on a child in an emergency custody order is not to be taken lightly. If you take the child under your care, you will be their temporary guardian. You will have to file for this order in a local family court in order to remove the child from their parent’s care. Be sure to consult with a family law attorney before making any movement to assume custody. The goal of an emergency custody order is to provide a child with a temporary guardian while their parents are either questioned or sentenced. In most states, the main objective is to repair the problems in the family home and reunite the child with their parents. Of course, this is only after the parents in question have been documented and sent to a rehabilitation center. This, typically, will occur if the parent, or parents, struggle with alcohol or substance abuse. If a child is obviously in an environment where substances are in the home, they should be removed immediately. Assuming custody, even temporary custody, is a huge responsibility. When you assume custody of a child, you are solely responsible for their wellbeing. And, with emergency orders, you may have to re-submit your guardianship. For example, most temporary guardships only last up to 60 days, however, many are on a case-by-case basis, so the child could be in your custody for a lot longer. 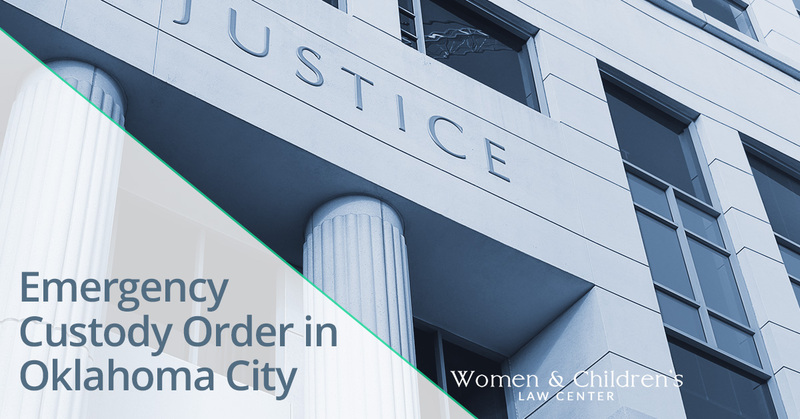 If you are interested in family law in Oklahoma City, contact Women and Children’s Law Center today. We have law professionals that can consult with you on your options and how to proceed with a temporary custody order. Contact our law firm today.